Officials hope to save ornate brickwork on the west entrances of the old Roann School, among other things. Photo by Joseph Slacian. 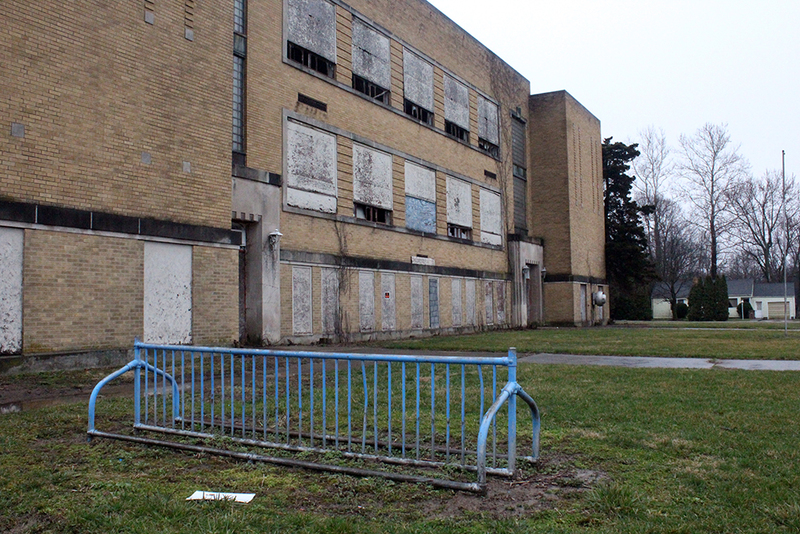 ROANN – Three firms submitted bids on Tuesday, April 10, to raze the old Roann school building. Dore & Associates Contracting, Bay City, Mich., for $256,662. Strebig Construction, Fort Wayne, $347,611. Merrit & Son Excavating, Kokomo, $320,250. A Wabash County dump truck plowed into an Urbana home on April 11. Photo by Joseph Slacian. 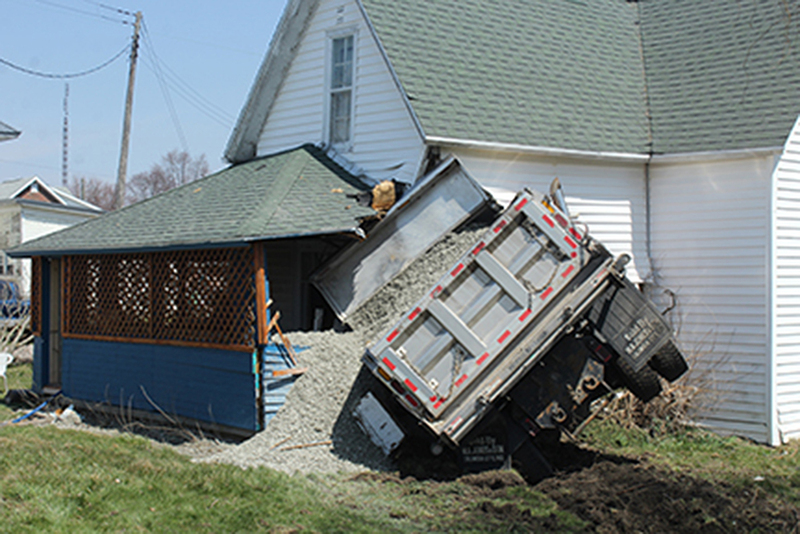 A dump truck hauling a load of gravel crashed into an Urbana home just after 1 p.m. Wednesday afternoon, April 11. 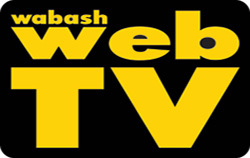 According to a crash report provided by the Wabash County Sheriff’s Department, authorities responded to reports of a dump truck crashing into a house on State Road 13 near the intersection of College Street in Urbana at approximately 1:13 p.m. Wednesday. The driver, Jeffrey A. Weimann, 63, Roann, explained that he was northbound on State Road 13, but that he did not know why his truck ran off the roadway and struck the residence at 210 South State Road 13. NORTH MANCHESTER – Manchester University will break ground on the Lockie and Augustus Chinworth Center at 4:30 p.m. Friday, May 11. Janet Halderman explains to Southwood third graders the significance of paintings in the Drawing Room of the Honeywell House on Thursday, April 12. Around 300 students in the area took tours of the Honeywell House throughout the week. The Wabash Unit of the women’s committee of the Indianapolis Symphony Orchestra hosted its 14th-annual tour of the Honeywell House for the third grade classes in Wabash area schools the week of April 9. The event coincides with the students’ social studies history standards that require students to describe how significant people, events and developments have shaped their own community and region. The students toured 10 rooms in the home, and had a variety of objects explained to them by committee members. Indiana Landmarks and Indiana Farm Bureau are seeking nominations for the 2018 John Arnold Award for Rural Preservation. The award recognizes the preservation and continued agricultural use of historic farm buildings in Indiana. A brief history of the farm and description of its significant historic structures and features, such as the farmhouse, barns, agricultural outbuildings, and landscape elements. A description of how the farm’s historic agricultural structures are used in day-to-day farming operations, and how they have been preserved or adapted. High-res digital photographs of the farm and its preserved historic features. FORT WAYNE – For the fourth consecutive year, Parkview Health has earned the Advisory Board Workplace of the Year Award. The annual award recognizes hospitals and health systems nationwide that have outstanding levels of employee engagement. The 67th annual observance of the National Day of Prayer is Thursday, May 3. The Wabash observance of the National Day of Prayer will be held May 3 from 12:10 to 12:50 p.m. on the north side of the Wabash County Courthouse. 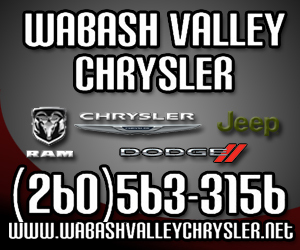 The event sponsor is the Wabash Area Ministerial Association. The 2015 flood caused significant tree damage around the Salamonie property. Volunteers, either individually or as a group, are sought to help plant trees on April 21, from 10 a.m. to noon, in the Lost Bridge West SRA. Those interested should meet at the Salamonie Interpretive Center at 10 a.m. and be prepared with closed-toed shoes, blue jeans, and gloves. All other equipment will be provided.